The end of World Vegan Month is fast approaching. 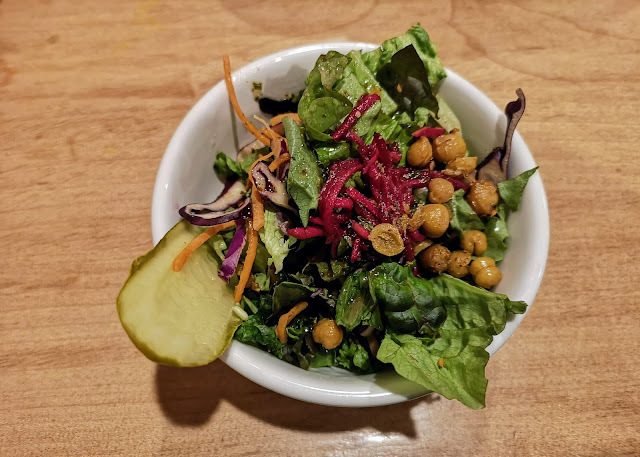 We have managed to visit 8 places in Metro Vancouver that accommodate or specialize in plant based diets and we have discovered several more that we will try in the future. We don't claim to have done much to save the world, but we feel good and have tried to spread the message through this humble blog and on Instagram. Remember, if you haven't already read it here, that more than half of all global warming gasses are produced by the animal agriculture industry. Yes, we like our meat but it is not to contributing to the well being of the planet that will be inherited but your children or their children. Any way, it turns out that Chickpea is our favourite. This is a funky upbeat place on Main not far from King Edward, offering an all vegan menu but they own a deep fryer! That seemed to make the difference to us this month! I am done with bowls! This menu is a bit of a challenge with all its possibilities. Choose your style of mean first, then choose you main and any sides. 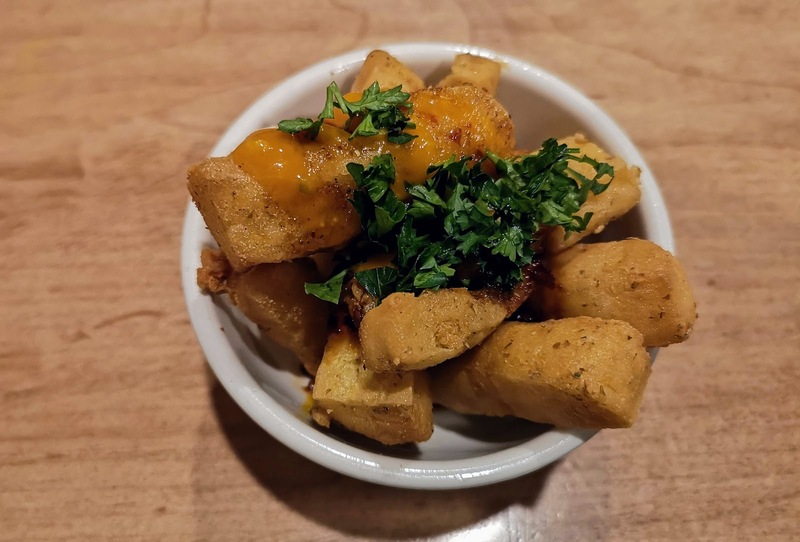 Chick Pea Fries were one of our sides and they truly hit the spot. Served with a sweet chili sauce and mango sauce, these were a nice change from French fries. 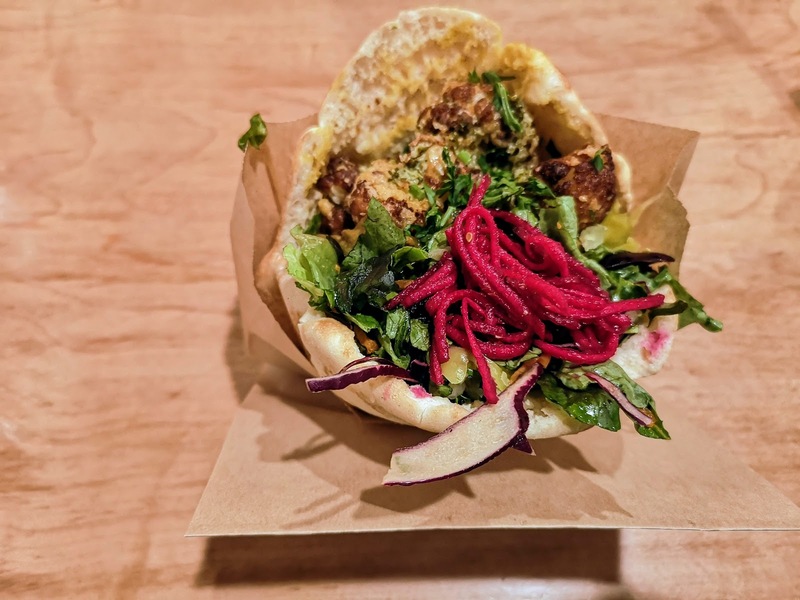 For our mains, we first chose Kasum (deep fried cauliflower with mushrooms and lemon garlic sauce) served as a pita. A tasty variation on a falafel sandwich, the garlic sauce was strong and brought it altogether. Make sure you have plenty of napkins! 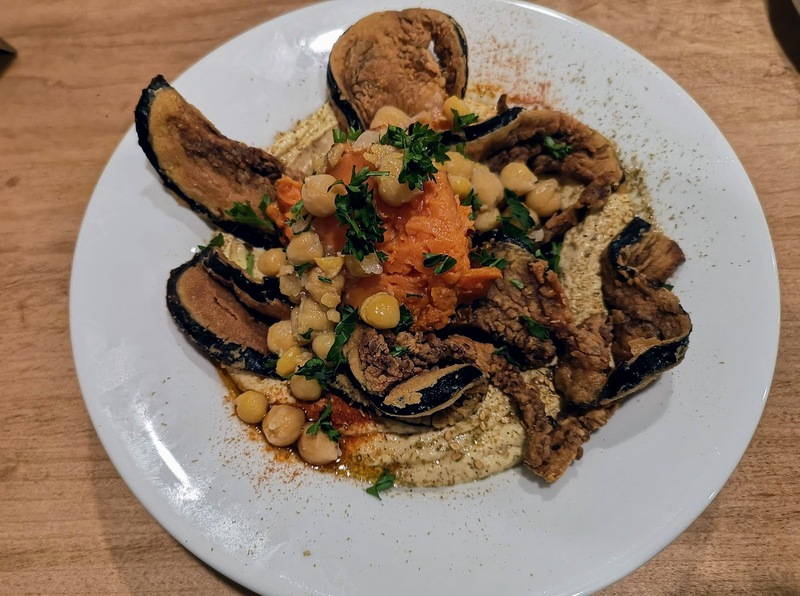 For our second main, we chose Sabich (deep fried eggplant with chick peas and sweet potatoes) which we had served as a hummus plate. Not surprisingly, they killed it on the hummus. It was excellent and this was a wonderful plate. My only criticism of the whole meal was that the eggplant was not particularly hot out of the fryer. I feel like it waited some for the other meal components. 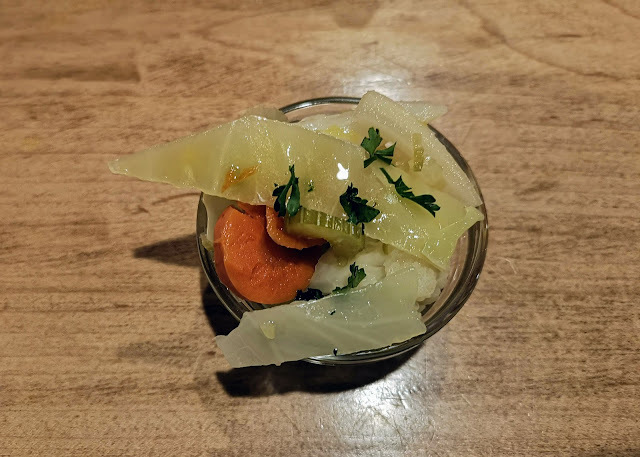 As one of our sides, we chose their pickled veggies and we loved them! Who knew that you could pickle turnips? Finally a side salad came from somewhere. I'm not sure what it belonged to but the dill pickle was amazing and we liked the crunchy deep fried chick peas that topped the salad. 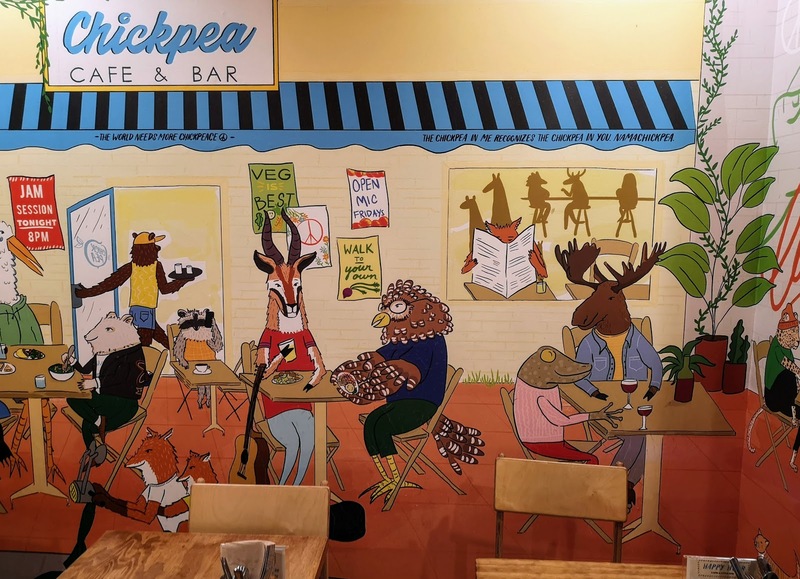 I feel like we barely scratched the surface at Chickpea with several other tempting items waiting for our return! 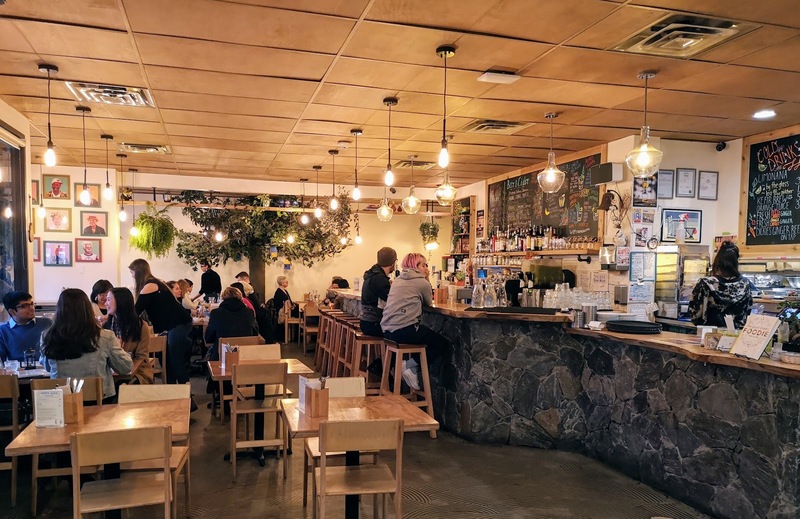 Our most enjoyable vegan meal in Vancouver this month. We recommend Chickpea for healthy, delicious, guilt free eats!